Choosing your reunion place can be easy for some but rather complicated for others. Share your experiences; particularly those that you think would be of interest or helpful to others who are organizing reunions. E-mail us. by Jacky Runice Help On The Web When you undertake Christmas dinner for five to ten people, it’s a manageable mission. When your college student invites frat brothers (with bellies enlarged by keggers) and the in-laws invite their in-laws, admit it—you start asking for jell-o molds and help in the kitchen. It’s the same system with reunions. When I think about how I experience stress planning, coordinating and implementing just a trip for a family of five, with adults, teenagers and a rambunctious third-grader, I can’t imagine organizing a gathering for 20, 30 or 100 people, without help. Plenty of businesses hear your yelps for help and are ready to provide the trimmings for your reunion entrée. You know how to find immediate family or army buddies, but how do you cast a net wide enough so you’re not spending hours searching the web for remote relatives and friends? Switchboard.com provides free access to over 105 million residential listings. With over 148 million internet users in the US, searching online to find friends, classmates, veterans or family members is a convenient and effective source for locating people and businesses nationwide. “Not only can switchboard.com help friends find old buddies or families locate lost loved ones, but you can use additional resources to plan reunion details—free and from the comfort of home,” explained Michele Greenberg, Corporate Communications Manager of Switchboard Inc. Switchboard.com helps reunion planners find people: search by name and city/state to locate phone numbers and addresses, or reverse search by entering a phone number. Check out Switchboard’s Stories section for reunited family stories. The website’s integration of TurboTrip’s hotel booking system lets you instantly make reservations on thousands of hotel/motel listings nationwide. It’s easy to search by category and location to find car rentals, airports and tourist information. Need a caterer, florist, or party supply store? Business phone numbers allow you to call in advance for hours or weekly specials. Save time by locating the best route to your meeting place and print directions in a snap to include with invitations. You’ve found them and getting there won’t be half the fun if you’re flying. Consumer studies rate Orbitz.com tops in ease of use, and Orbitz is the first travel site to allow small groups and larger families to purchase up to nine tickets at a time so users won’t have to worry about booking everyone on the same flight! This upgrade saves time and assures that family members will be seated together. The company’s new site design and exclusive features make it easier than ever to find and book the best flights at the lowest costs, and to obtain flight times, plane changes and number of airline stops. It takes only three clicks to book air tickets and hotel rooms, just four clicks to also rent a car. Plus, travel websites like Orbitz and individual airline sites offer last-minute discount fares. Con Hitchcock, chairman of Orbitz’s Consumer Advisory Board, has more tips. Book flights scheduled for off-peak hours and days. Fares may be lower if you avoid early-morning or late-afternoon airport “rush hours.” The cheapest last-minute travel time is often a Saturday morning departure returning Monday or Tuesday. Expand your search to include smaller airports if you’re traveling to or from a major city served by multiple airports (e.g., Chicago Midway, Oakland Airport, Baltimore-Washington). Bargains may not be available if you limit yourself to principal airports. Finally, book on sites with 800-customer service numbers in case of questions or problems. For more information, visit www.orbitz.com. Of course, the first and best resource for anything to do with reunions is this very magazine and it’s extremely helpful website www.reunionsmag.com. 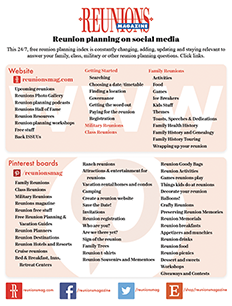 The only publication on the planet for all planners — military, family, class and any other permutation of reunion — Reunions magazine features resources, tips, ideas and advice from journalists as well as those out in the trenches — other reunion planners. The magazine and website match planners with destinations, facilities and suppliers who are eager to help create a successful meeting. Take a look at the extras, such as creative ideas about games, activities and traditions that will enhance your reunion. The website, updated regularly, takes you from “Getting Started” to how to share your winning gathering with the rest of us. Honestly, how many websites actually encourage you to print pages right from the site in order to share with your committee members? 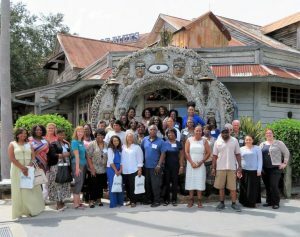 Reunions magazine is all about helping you achieve memorable, exciting meetings that enrich the lives of every family member, veteran, class mate or friend who takes this remarkable journey with you. Help From CVBs Smart Convention and Visitors Bureaus (CVB) are expanding websites to ensure smooth planning and a successful event. For example, the Sarasota, Florida, CVB offers a separate meetings website (www.SarasotaMeetings.com). “It’s easy and efficient for all planners to utilize,” said Jennifer Huber, Sales & Marketing Director of the Sarasota CVB. “Planners can use it to find available area accommodations, facilities and services. Families can rent out the Stardust Event Center (a roller rink), hold a pizza party and skate away if they’d like,” she said. “The planner can contact the properties directly or complete an online request for proposal (RFP) form which is automatically distributed to CVB members. Planners can request a meeting planner guide, with information to help them plan their stay.” Jenny S. Martin, Public Relations Manager of the Sarasota CVB, is excited about the area’s terrific meeting venues. The Colony Beach & Tennis Resort on Longboat Key has an impressive new venue at the resort, as well as a meetings and events coordinator (800-4-COLONY). “The Hyatt Sarasota has a wonderful meeting facility. In fact, a group recently celebrated their 25th anniversary and marked 25 consecutive years of meetings at the Hyatt Sarasota. They do events of all sizes, big and small—this week they have a group of 1,200 coming,” according to Martin. The Radisson Lido Beach recently underwent a $25 million renovation, now offering 5,800 square feet of flexible meeting space, including a 3,000 square-foot ballroom that accommodates up to 300 guests—great for military reunions! For details, surf to www.SarasotaFL.org. Many CVBs offer planning workshops that introduce their services and those of their hospitality members: rather like one-stop-shopping! Most are free and well worth your time to attend. 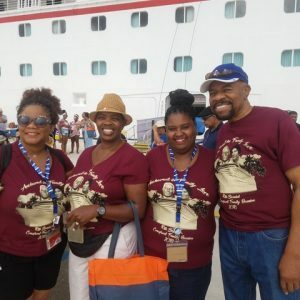 Destination reunions are increasingly popular and according to a recent survey by the American Society of Travel Agents (ASTA), at least two-thirds of agents who booked travel for family reunions within the past year cited cruises as the most popular destination. Just as there are countless ski and beach resorts, cruise choices are mind-boggling for the planner. The simple solution is to research those that go the extra nautical mile for reunions. 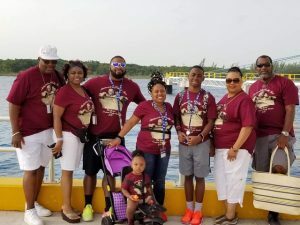 Royal Caribbean International recently introduced a new program, Royal Reunions, designed to enhance family and group gatherings. Dan Hanrahan, Senior Vice President, Marketing and Sales, for Royal Caribbean commented, “Cruising is an ideal choice for both small and large groups that want to travel together, and our new Royal Reunions program takes group travel to a new level with additional amenities and activities that make a special event even more enjoyable and memorable.” The ships offer all the successful reunion components — activities for all ages, group dining, nearby or adjoining rooms, an award-winning Adventure Ocean kids program, shopping and entertainment—all neatly bundled into a convenient and affordable package. The new Royal Reunions program offers two reunion packages. The standard Royal Reunions package includes fun touches like festive stateroom door decorations, a welcome aboard letter from the captain, special Royal Reunions logo gifts, a group photo for each member and a personalized farewell cake the last evening of the cruise. Guests also get a choice between passes to the Aqua Park at one of Royal Caribbean’s private beach destinations or a special Sports Deck pass that allows holders to go to the head of the line. All groups are invited to compete in a Daily Reunion Challenge that has them matching wits with other reunion groups onboard. The Royal Reunions Elite package includes the standard package’s amenities and adds organized group activities run by the ship’s cruise staff and daily VIP treats delivered to each member’s stateroom. Royal Reunions packages are available to groups booking eight or more staterooms at an additional $50 per person for the standard package, and $100 per person for Royal Reunions Elite. Royal Reunions packages can be enjoyed on all of Royal Caribbean’s Voyager-class ships, with plans to take the plan fleet-wide with additional package options. Visit www.royalcaribbean.com or call 800-327-6700. Choosing your reunion place can be easy for some but rather complicated for others. 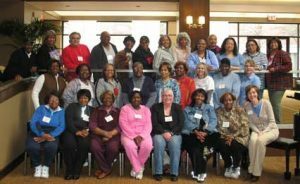 Share your experiences; particularly those that you think would be of interest or helpful to others who are organizing reunions. From the YMCA of the Rockies, the Continental Divide is a must see, at 10,759 feet. After each reunion, we realize that the place really doesn’t make much difference. We create our own entertainment and enjoy being together so much, we could meet at the city dump and have a great time. Still, choosing a reunion spot can be a challenge. Our reunion, called the Brolras, was organized by six female cousins who have a secret meeting at each reunion to decide where we will meet next. It’s actually our time to be together without spouses and kids. We choose the area together and then take turns finding the place and doing the planning. We agreed long ago that the reunion would never be near anybody’s hometown so everybody can travel and see new sights. Criteria for choosing our reunion site. Location. We all live in Missouri or California. So far we’ve been to many reunion sites in our home states and in between. Dates. With many school age children, we choose a week near the end of July or at the beginning of August. These are, admittedly, prime tourist travel months and can be more expensive and congested. Cost. We’ve agreed to stick with condos, lodges and other nicer accommodations. It takes some shopping to find affordable rooms with cooking facilities and a meeting room where we can congregate. Our best luck has been at large resorts with condos that sleep 10 to 12 people. We don’t want cost to keep anyone away. We’ve even reconsidered venues to avoid exorbitant summer prices. Amenities. Our family loves outdoor sports and eating, so we look for swimming pools, golf courses, lakes, bikes, horses, skating rinks and beaches. We like to have several kitchens and a large meeting room for our Talent Show. Activities. We try to choose an area that offers additional activities such as museums, sightseeing, shows or other entertainment. the more expensive the flights. Elevation. We keep our reunions at 6,500 feet or lower to accommodate an uncle who had a heart by-pass and is more comfortable at lower elevations. Weather. We are not particular about weather but shy away from high humidity. This is our menu of venues with a list of activities we enjoy. Lake Tahoe, California. Boat rides, casinos, tram ride to Heavenly Valley, dinner shows and golf. Snow Mountain Ranch, Grandby, Colorado. Overnight camp-out, roller skating, horseback riding, ski lift ride, fishing, crafts and golf. Clear Lake, California. Boating, water skiing, swimming, tubing, water polo, miniature golf, tennis and golf. Lake of the Ozarks, Missouri. Boating, water skiing, hot dogging (inflatable six person torpedo rafts pulled by a boat), hiking, spelunking (Bridal Cave), shopping, fishing, Lake of the Ozarks Water Show, Country Shindig Opry, go-carting and swimming. Pagosa Springs, Colorado. Bar-B-Q/hayride, boating, fishing, swimming and golf. Del Mar, California. Horse races, beach, shopping, swimming, tours and golf. Sun River, Oregon. Biking, brewery tour, site seeing, swimming, line dancing and golf. Black Hills, South Dakota. Mount Rushmore, Custer National Park, sightseeing and a surprise! wedding. The author’s daughter took advantage of the family being together. Karen Robertson is a teacher, freelance writer, speaker and professional clown. She lives in Wildomar, California, with her firefighter husband, Barry. Her articles have been published in over 35 magazines and her first book, Raising Kids Right: Morning, Noon, and Night was published in 1998. The Georgia Music Hall of Fame is a wonderful intergenerational option entertaining fans of performers as diverse as Lena Horne, Tommy Dorsey, the B-52s and Trisha Yearwood. Thematic exhibits offer plenty of interactive fun, musical artifacts and nostalgia. Hometown boys, the Allman Brothers, have their own shrine here as well as in the magnificent Rosehill Cemetery where Berry Oakley and Duane Allman rest. Make a date with some of the most interesting dead people during one of Phil Comer’s “Rose Hill Rambles” Cemetery Tours (478-742-5001). The native Maconite enchants guests with his breadth of local history knowledge and lore from the Confederate graves to those of the aforementioned rock stars. Halloween ideas, anyone? Drive a NASCAR simulator, kick the winning field goal and throw the last second TD pass on a football field or shoot hoops at the Georgia Sports Hall of Fame. In the museum’s theater, you can sit in a stadium of yesteryear or be part of the crowd at old Ponce de Leon Park in Atlanta where the historic Crackers played. The Georgia Music Hall of Fame, Sports Hall of Fame and the Tubman African American Museum are within walking distance of each other. The Tubman features achievements of great American inventors, artists, writers, musicians, military leaders and more. There will be a new larger Tubman Museum in 2003. History buffs won’t want to miss the Cannonball House where a Union shell remains after it crashed through the parlor and rolled across the floor in an 1864 attack. A trolley stop across the street from the 1842 Inn, takes visitors to all of the aforementioned attractions for a mere 25 cents, as well as famed poet Sidney Lanier’s cottage and the historic Douglas Theater where Little Richard and Otis Redding performed in the 1950s. The restored theatre now serves as a state-of-the-art film, performance and meeting venue. The Macon-Bibb County Convention & Visitors Bureau (800-768-3401) or email at maconcvb@maconga.org can inform reunion planners about “Around-Town Tours,” packaged attractions at up to 25% discount including historic homes, interactive museums and trolley transportation. Thousands of Macon’s acres are National Register Historic Districts. You won’t want to miss National Historic Landmark Hay House, an Italian Renaissance Revival Villa, completed in 1859, featured on A&E’s “America’s Castles as the Palace of the South.” Ocmulgee National Monument reaches way back 12,000 years ago to Native American life with great earthen mounds, artifacts and dioramas. Back at the 1842 Inn, the daily hospitality hour lingers from 5:30 to 7 PM. This is the south, so indulge in one of Miss JoAnne’s persuasive mint juleps while younger travelers nibble freshly baked cheese straws, cold chicken salad on crackers or warm artichoke dip. Emma Williamson, another of the Inn’s fine associates, may get the little hairs on the back of your neck to stand at attention with her ghostly experiences in the AAA Four Diamond property. Williamson and JoAnne Dillard are Macon graciousness experts. Music fans must have dinner at the Tic Toc Room, where Little Richard held court in the early 1960’s. Remember the singer’s “Long Tall Sally?” She was a daughter of the site’s original owner. Today, the restaurant boasts a young chef who does wild and wonderful things with fried green tomatoes, Macon-style crab cakes and other southern delights. Bert’s, on lively Cherry Street, kicks Southern food up a notch with offerings such as “New Southern Grits Cakes (ladled with roasted pepper cream sauce and grilled portobello mushrooms) and an astonishing wine list. For incredibly cheap and down-home barbecue, townsfolk swear by Fincher’s BBQ. A pig (chopped pork) sandwich or a Brunswick stew will set you back $1.83. The restaurant boasts that it was the first BBQ to go in space in the 1989 space shuttle. (Finally, the government making good choices!) Fincher’s caters, too. The 1842 Inn is a perfectly delicious retreat for groups who want to experience the kindness of strangers. Call 800-336-1842 or mosey over www.1842inn.com especially if you want to visit during the annual Cherry Blossom Festival. Macon’s 270,000 flowering cherry trees are celebrated in the Cherry Blossom Capital of the World each March. The 1842 Inn has a 25 person meeting space, pets are allowed and it is handicap accessible. Y’all come down now, ya hear? Every planner’s nightmare is the reunion that ends too early. Months of planning culminated and expended in just a few short hours. The reunion site fills early in the day. The air resounds with boisterous greetings and laughing children, giving the reunion planner’s heart a boost. “A success!” you think, watching relatives hug, tease and generally enjoy being with one another. Photo albums are passed. Cameras whir as members attempt to capture the essence of the day on film. Soon it is mealtime. With hunger satisfied, and children off to play, adults enjoy an easy camaraderie. A few older folks begin to tire and slowly take their leave. Then, you look around and wonder what in the world just happened! It is mid-afternoon and all that is left of the reunion is you and the clean-up crew. Though the devastation can be a bit daunting, there is clearly only one acceptable form of action. Find and fix the problem. The first time this happened at our family reunion, I got upset. The second time, I was determined to figure out what was wrong. Taking into consideration the good number of members each year, a reunion was obviously desired. So what was wrong? The reunion site itself was lovely. A covered pavilion with kitchen facilities, restrooms, ample seating and table space set in a grove of pine trees. A sandbox, volleyball court and baseball field were nearby. A creek meandered through the park area with wooden bridges crossing at short intervals. 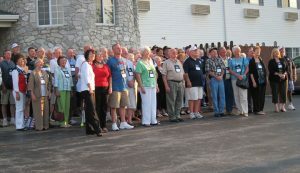 Our reunions were held each year in June. June in Oklahoma can take your breath away … literally. The summer sun is hot and the humidity is sometimes horrendous. As a mother with two young children, I realized that parents with very young children were occupied keeping kids off bridges and out of the creek. For the kids there were no boundaries. Children age five and up love digging for crawdads. We were losing some older folks as well as younger ones early because of the oppressive heat. Young mothers were exhausted chasing children and children were unhappy because they couldn’t do what they wanted. Our solution was to change the reunion site. We found a church recreation center for family reunions available to rent. It has a kitchen area, ample tables and seating space. There is a fenced play yard for children who wish to brave the heat, and for those who do not, there is indoor skating, volleyball or basketball. Older folks trade off a bit of noise for the air conditioning. They also realize that to keep children interested in family gatherings, there must be something interesting or fun for them. The very young have the run of the place but outdoors is inaccessible without an adult to open the door. Our new location makes for a relaxed, enjoyable day for everyone. And I no longer find myself standing alone in the middle of the afternoon, wondering what in the world happened.